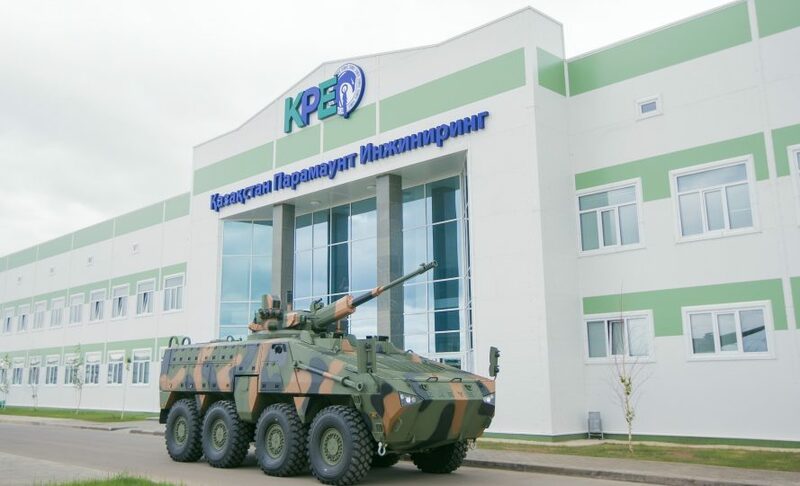 Kazakhstan Paramount Engineering (KPE) has unwaveringly from its inception in 2015 transformed into a dynamic success story, today hosting one of the largest and most modern armoured vehicle facilities in the world. The factory was originally established to serve the needs of Kazakhstan and surrounding countries; the facility has however, excelled in both quality and efficiency. The KADEX 2018 International Exhibition presently underway served as an appropriate venue to Paramount Group’s announcement of KPE ‘graduation’ in joining its global supply chain and for the Group’s announcement regarding exciting expansion ambitions in country, including the production of components, sub-systems and vehicles within the KPE facilities for Paramount Group’s many markets around the world. In addition to enhancing the technology transfer and local manufacturing model championed by Paramount Group, realized globally through strategic alliances with governments and strong local partners, Paramount Group indeed announces its plans to expand the Kazakhstan Paramount Engineering (KPE) portfolio in to additional arenas where the organization is actively involved, including however not limited to aerospace, unmanned aerial vehicles (UAVs) and naval vessels production, creating a further conducive environment for the Eurasian nation’s defense and technological industrialization, working alongside the Ministry of Defense in enhancing those industries that have already positioned the country amongst the elite worldwide in capacity. Ivor Ichikowitz, Group Chairman of Paramount Group said: “Our experience in Kazakhstan has thus far been remarkable, to say the least. In our experience, countries that have a strong resolve to develop their defense industry capability enhance their overall technical competence and contribute to overall economic development. We have seen this happen in Kazakhstan. It is due to the vision of President Nazarbayev that we have together created a platform for sustainable defense industry capability. It remains an honor and privilege to collaborate and expand Kazakhstan Paramount Engineering (KPE) in portfolio and scale, and we look forward to investing in developing new technologies and playing our role in the nation’s continued industrialization and development”. Due to the success of the investment in Kazakhstan’s defense industry and experience steering Kazakhstan Paramount Engineering (KPE), Deputy Director General Johan Delport has been appointed to the position of Global Head of Paramount Land Systems. Johan’s close collaboration with Kazakhstan’s defence forces and experience gained from this partnership, one which consistently innovates to match the challenges of a diverse yet often harsh operational environment, has allowed him to perfect the highly-advanced, world-class vehicles presently on display at KADEX, with production on new orders well underway, and further deliveries expected during 2018-2019. Aibek Baryssov, Head of the Supervisory Board of Kazakhstan Paramount Engineering (KPE) said: “It remains the privilege of Kazakhstan Paramount Engineering (KPE) to collaborate with Paramount Group, an important player within the global defense and security industry. I’m proud beyond words of the exemplary work that we have accomplished in building the KPE brand and hope our success story drives further, cross-sectoral investment opportunities in Kazakhstan in future. We are also very proud to have achieved the high level of quality standards and productivity demanded by Paramount Group in order to be part of its global supply chain”.